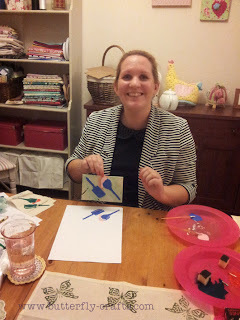 I have wanted to try out a few new crafts recently just to see if anything else takes my fancy and one of those was Lino Printing so when I saw local craft workshop Betty Makes, from Newmarket, was running an evening workshop I jumped at the chance to book. Being a bit of a nervous type I didn't fancy going alone and so Holly from Ilex Made This came along with me. Lino printing is a print making technique in which a sheet of linoleum (sometimes mounted on a wooden block) is used for the relief surface. A design is cut into the linoleum surface with a sharp knife or V-shaped chisel with the raised (un-carved) areas representing a reversal (mirror image) of the parts to show printed. The linoleum sheet is inked with a brayer and then impressed onto paper or fabric. Betty Makes is a lovely little studio room run by Jean-Mary and it is such a pretty place to be with craft materials displayed and a big table for the students to sit around. Classes fit up to eight but at this workshop is was just Holly and myself which meant we had lots of space to get messy! Jean-Mary started off by talking us through what we would be doing - drawing out a design on to paper, transferring it to the lino and using tools to cut it out, and then printing on to our blank tea towel. As it was just Holly and I we also had time to print a couple of cards and Jean-Mary explained the different paints to use on paper rather than fabric. Now, I am the first to admit that I am AWFUL at drawing, I even struggle with stick men, and so I may have cheated slightly and took along some of my paper-crafting stamps for inspiration. 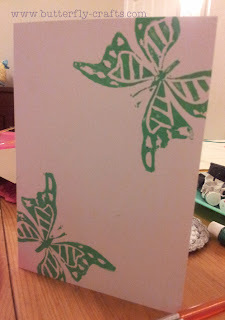 Once I decided upon the butterfly I traced the design on the stamp packaging and used that, but I don't mind, I think it came out great! 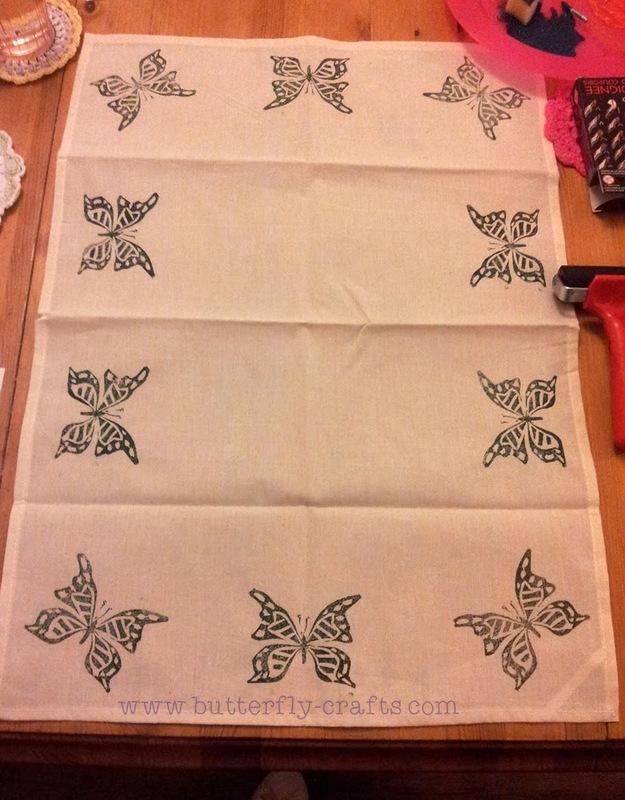 I am pleased with the design around the tea towel and may use this as part of a Christmas hamper as a gift at Christmas. I also made two cards and prefer this one with two butterflies in the corners rather than the one big butterfly which is on the other card. Holly did great drawing her baking utensils from scratch and I love the design she made in bright colours. We both really enjoyed the workshop and I think we may both have a go at this technique again, but if not, I can still see me returning to Betty Makes to attend more workshops! If you would like to have a go at Lino Printing why not take a look at the Betty Makes schedule?